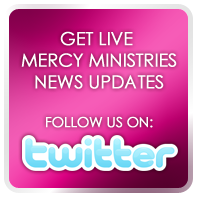 Mercy Ministries News: Mercy Ministries Hero – Pam Winters!!! About 15 years ago, Pam Winters came across an article about Mercy Ministries in a magazine she was reading and knew right away she had to help. Pam and her husband, Larry, are the founders of Leadership Team Development (LTD – affectionately referred to as Living The Dream). Larry and Pam have literally helped bring in millions of dollars through the years to support the work of Mercy Ministries. They have become dear friends of Mercy Founder and President, Nancy Alcorn, and love spending time with her and our residents whenever possible. This weekend, Pam visited the St. Louis home with her daughter, Tara, and her sons’ girlfriends, Caitlyn and Kim. On Friday, these amazing women arrived at the St. Louis home where the residents prepared some of Pam’s recipes for a delicious dinner. For dessert, everyone enjoyed two beautiful cakes that were carried by hand on the plane from Pam’s home in Raleigh! After dinner, they spent some time playing games with the girls and ended the evening with an amazing devotion. Pam reminded the residents that their Father is the King of Kings and they are all princesses. She generously gave each resident a crown ornament as a reminder of how God sees them. On Saturday, the St. Louis residents were invited to watch Pam’s son, Ricky, a professional motocross rider, compete in a big race at the Edward Jones Dome. The event began with a spectacular fireworks and pyrotechnic show and stunts by some amazing riders. The girls had great box seats and enjoyed hot dogs with all the trimmings. It was a great time of fun and fellowship. St. Louis residents loved the Supercross Event! Mercy residents loved the box that Pam provided. So fun cheering on Pam’s son, Ricky! Yesterday, Pam and her daughter, Tara, arrived at the Nashville home with Caitlyn and Kim to share a special message with the staff and residents. Hearts were touched as Pam shared part of her personal testimony, and many of the residents identified with her story of past abuse. She talked about how she first became involved with Mercy Ministries and said that Nancy Alcorn is not just a friend, but she is one of Pam’s heroes. Mercy Ministries wants to say a special “thank you” to Larry and Pam Winters and all of the LTD organization for their amazing support throughout the years. You have spread the vision of Mercy to thousands through your business, and your faithful contributions have provided hope and healing to so many young women! You are our heroes and we love you!